It doesn't take four hours to figure out Tom Petty. Everything anyone needs to know about the man is tucked neatly into a few deliciously tense moments in the Peter Bogdanovich-directed Petty doc Runnin' Down A Dream, which really does clock in at just under 240 minutes. It's a rare peek into the sleazy morass of the recording industry that someone captured on film years ago. Petty's in a studio with one of his most important influences, Roger McGunn of The Byrds, who is working on a solo album. The control room is tight and claustrophobic, and there's a youngish record company executive there telling McGuinn he has written him a song that should be recorded for the release. Petty looks at the song and immediately dismisses it as not worthy of McGuinn's standards. He's droll and derisive, reading some of the lyrics out loud and sneering at them. "I could smoke a joint and write three lines better than that," he says. Then he turns on the record company man, who tries half-heartedly to defend him work against one of America's greatest singer/songwriters. McGuinn is laughing nervously as Petty stands over the other guy, tells him that he's "very suspicious" of his motives and accuses him of getting "points" -- ie. a kickback from the record company -- if the song gets on the album. 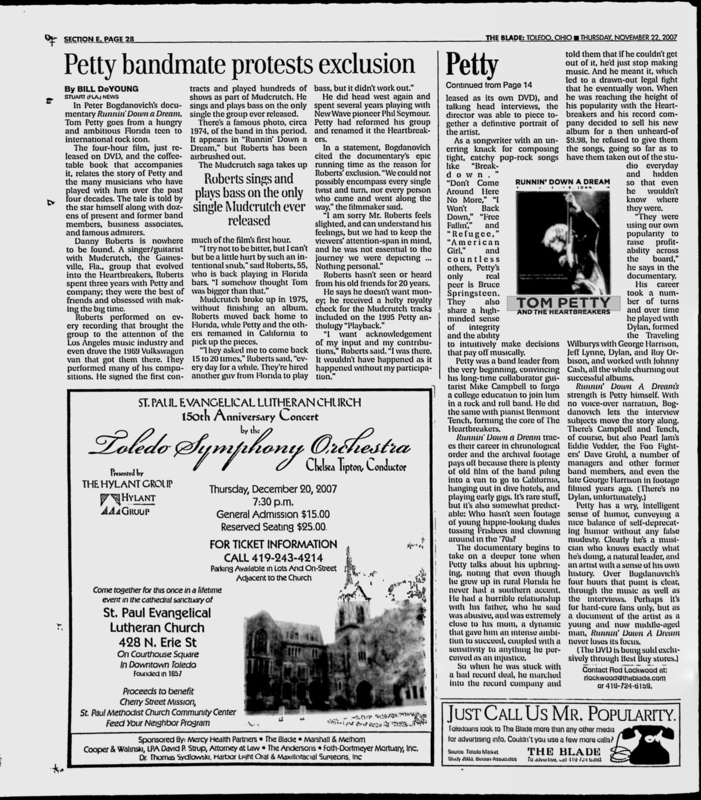 Petty doesn't back down, of course, and McGuinn agrees not to record the song. The older musician's lack of confidence -- it's obvious that he would have dutifully recorded the song if Petty hadn't been around and he pretty much says so later -- makes you squirm. You mean artists like Roger McGunn really let some callow corporate shill tell him what songs he's going to record? But most importantly, Petty's staunch defense of his friend and willingness to create a scene on his behalf define in a few awkward, nervous minutes what Bogdanovich explores in detail throughout the documentary: Petty is a fearless defender of his own integrity and that of anyone with whom he's associated and he's put his career on the line more than a few times to prove a point. 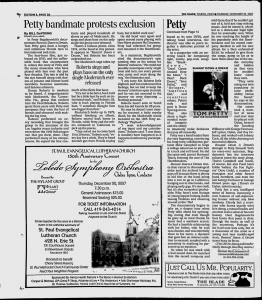 "They were trying to make the artist into something he wasn't in order to sell him a certain way," Petty says years later, summing up a decades-long battle that he always wins, either as a solo artist or with his long-time band the Heartbreakers. Runnin' Down a Dream, which includes a full-length concert and a CD of musical rarities, was born when Petty's management team wanted to do something more than just a 30th anniversary concert in Gainesville, Fla., where the proto-Heartbreakers started playing as Mudcrutch. Through a series of connections, Bogdanovich -- the director of The Last Picture Show, Paper Moon, and Mask -- was brought in to put the film project together. Taking advantage of hundreds of hours of archival material that band members shot early in their career, concert footage (including some great stuff with Bob Dylan when PEtty and The Heartbreakers backed him that begs to be released as its own DVD), and talking head interviews, the director was able to piece together a definite portrait of the artist. As a songwriter with an unerring knack for composing tight, catchy pop-rock songs like "Breakdown," "Don't Come Around Here No More," "I Won't Back Down," "Free Fallin'," and "Refugee," "American Girl," and countless others, Petty's only real peer is Bruce Springsteen. They also share a high-minded sense of integrity and the ability to intuitively make decisions that pay off musically. Petty was a band leader from the very beginning, convincing his long-time collaborator guitarist Mike Campbell to forgo a college education to join him in a rock and roll band. He did the same with pianist Benmont Tench, forming the core of The Heartbreakers. Runnin' Down a Dream traces their career in a chronological order and the archival footage pays off because there is plenty of old film of the band piling into a van to go to California, hanging out in dive hotels, and playing early gigs. It's rare stuff, but it's also somewhat predictable: Who hasn't seen footage of young hippie-looking dudes tossing Frisbees and clowning around in the '70s? The documentary begins to take on a deeper tone when Petty talks about his upbringing, noting that even though he grew up in rural Florida he never had a southern accent. He had a horrible relationship with his father, who he said was abusive, and was extremely close to his mom, a dynamic that gave him an intense ambition to succeed, coupled with a sensitivity to anything he perceived as an injustice. So, when he was stuck with a bad record deal, he marched into the record company and told them that if he couldn't get out of it, he's stop making music. And he meant it, which lead to a drawn-out legal fight that he eventually won. When he was reaching the height of his popularity with the Heartbreakers and his record company decided to sell his new album for a then unheard-of $9.98, he refused to give them the songs, going so far as to have them taken out of the studio everyday and hidden so that even he wouldn't know where they were. His career took a number of turns and over time he played with Dylan, formed the Traveling Wilburys with George Harrison, Jeff Lynne, Dylan, and Roy Orbison, and worked with Johnny Cash, all the while churning out successful album. Petty has a wry, intelligent sense of humor, conveying a nice balance of self-deprecating humor without any false modesty. Clearly he's a musician who knows exactly what he's doing, a natural leader, and an artist with a sense of his own history. Over Bogdanovich's four hours that point if clear, through the music as well as the interviews. Perhaps it's for hard-core fans only, but as a document of the artist as a young and now middle-aged man, Runnin' Down a Dream never loses its focus. In Peter Bogdanovich's documentary Runnin' Down a Dream, Tom Petty goes from a hungry and ambitious Florida teen to international rock icon. The four-hour film, just released on DVD, and the coffee-table book that accompanies it, relates the story of Petty and the many musicians who have played with him over the past four decades. The sale is told by the star himself along with dozens of present and former band members, business associates, and famous admirers. Danny Roberts is nowhere to be found. A singer/guitarist with Mudcrutch, the Gainesville, Fla., group that evolved into the Heartbreakers, Roberts spent three years with Petty and company; they were the best of friends and obsessed with making the big time. Roberts performed on every recording that brought the group to the attention of the Los Angeles music industry and even drove the 1969 Volkswagen van that got them there. They performed many of his compositions. He signed the first contracts and played hundreds of shows as part of Mudcrutch. He sings ad plays bass on the only single the group ever released. There's a famous photo, circa 1974, of the band in this period. It appears in "Runnin' Down a Dream," but Roberts has been airbrushed out. The Mudcrutch saga takes up much of the film's first hour. "I try not to be bitter, but I can't but he a little hurt by such an intentional snub," said Roberts, 55, who is back playing in Florida bars. "I somehow thought Tom was bigger than that." Mudcrutch broke up in 1975, without finishing an album. Roberts moved back home to Florida, while Petty and the others remained in California to pick up the pieces. "They asked me to come back 15 to 20 times," Roberts said, "every day for a while. They hired another guy from Florida to play bass, but it didn't work out." He did head west again and spent several years playing with New Wave pioneer Phil Seymour. Petty had reformed his group and renamed it the Heartbreakers. In a statement, Bogdanovich cited the documentary's epic running time as the reason for Roberts' exclusion. "We could not possible encompass every single twist and turn, nor every person who came and went along the way," the filmmaker said. "I am sorry Mr. Roberts feels slighted, and can understand his feelings, but we had to keep the viewers' attention-span in mind, and he was not essential to the journey we were depicting ... Nothing personal." Roberts hasn't seen or heard from his old friends for 20 years. He says he doesn't want money; he received a hefty royalty check for the Mudcrutch tracks included on the 1995 Petty anthology "Playback." "I want acknowledgment of my input and my contributions," Roberts said. "I was there. It wouldn't have happened without my participation."